Last night I went up for a quick session at Flagstaff, hoping to complete a problem I called Glass Plus, which is a RH version of Don't Touch the Glass at Nook's Rock. You pull on with two terrible holds, with a poor right foot and jump for the lip. This seemingly simple problem has taken me many many attempts to figure out. Last night, as the dark was truly closing in I finally stuck the lip and moved left to finish up on the jugs of DTTG. I was very psyched. The problem could be soft V10, maybe V9 if you are taller. The grade is hard to figure since I feel I am climbing pretty well and if it was easy, I think I would have done it a lot faster. The problem has a slightly lower start which will probably be V11 and which I will be trying soon. I then went over to Scott Rennak's house to buy some holds from his home gym. Scott is a longtime fixture in the climbing scene and I was particularly interested in whether he had any of the crimps from Crater, the climbing hold company he ran. I scooped up a few choice items and really there is a lot to choose from still. Here is the link to his craigslist ad. Some great deals are available on some first-rate grips. By the way if you are reading this blog, leave a comment. I appreciate hearing from readers. 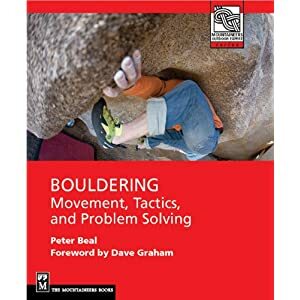 very well written and informative blog, i've gotten a bunch of great climbing info from your blog and with today's post, hopefully a bunch more holds for my friends garage wall, thanks and keep it up. Thanks for the comments Dave and good luck with the hold search! Hi Kate! 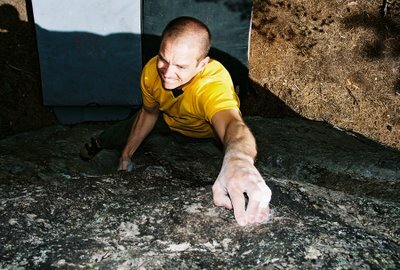 You may have seen the posts for the Organic bouldering pad sale. Go check them out. They are a bit more expensive but very well made. Also, there are some great photos on the blog. Keep them coming! Hey peter. I check your site all the time. you give some good info on flag and I cue me in happenings in the climbing world. keep it up. its always fun to drop by! Please post some photos of your new hangboard training device. Always looking for some new ideas. Thanks. I read your blog because you are getting old, have a full time job and child, yet still climb hard. That inspiring! More so than reading about another strong kid with no responsibilites who climbs hard. It would be interesting to hear a bit about the effects age has taken on your climbing and training. w3rd Peter ... keep it up. when making my daily blogosphere rounds, yours is one of the must-sees. Though there's quite a few thoughtful climbing clogs out there, I often visit here for the perspective that I hadn't yet considered. Thanks. Thanks so much everyone for the feedback! I will try to get back to more article-like posts when I have a bit more time. Yo Peter, I check your blog every couple days... have a link to it from mine. Nice with Glass Puss. I'm getting confused now on all the "problems" that stem from that same spot on Nooks. The problem's main difficulty lies in pulling on and getting established to make the throw. Don't Touch the Glass is much easier by comparison. The next plan is to start the left hand lower on a terrible edge and catch the current starting hold, reset and jump for the lip. What is Up at 8a.nu?